Who would have thought the barbecue—the great American pastime—could be big-time health detriment? And I’m not talking about eating too many hamburgers, hot dogs, and sausages or even having one too many beverages; I’m talking about the danger attached to the tools you use to clean it. There’s a new barbecue risk in town that you need to know about. If you use a brush with metal bristles to clean your barbecue grill, I strongly urge you to stop; and I’m not alone. A couple of weeks ago, Canadian surgeons started urging people to stop using them because there is no safe way to operate on people who have accidently swallowed these bristles. 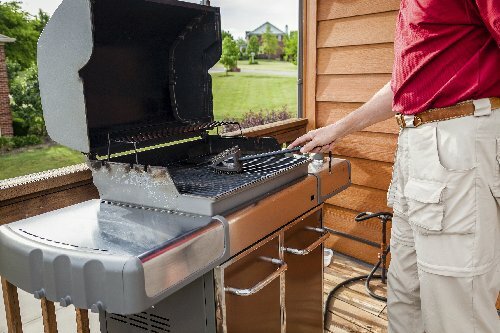 You see, when you clean your grill before or after barbecuing food, the bristles can become lodged on the grill…and you’ll never see them. Put some food on, and these bristles can quickly attach to the food and then have a really big chance of making their way into your mouth and down your throat. And when a bristle gets down there, any operation to fix it becomes very difficult, complex, and dangerous. When these bristles are swallowed, they can damage your throat and epiglottis, which is the piece of cartilage that covers the opening of your windpipe when you eat. The bristles can also move further down and into your digestive system, where they can become lodged in your intestine. What’s scary is that you might not even notice you’ve swallowed one. The symptoms can take over year to start, and pain may come and go. But if you do have damage to your epiglottis, throat, or small intestine, the damage can be substantial. A Canadian surgeon—who was involved in the decision to urge people to avoid these brushes—said that surgery is very difficult and quite risky. He said it’s like trying to remove an acupuncture needle stuck inside of a grapefruit without causing any damage to the fruit. Now, this isn’t always the case, but if it gets into certain areas—which is very possible—it can cause some real difficulties. The area around your throat is sensitive—especially near the epiglottis—and so far there doesn’t seem to be a sure-fire way of removing the bristles safely. This has been a growing problem encountered by doctors, and the reality is likely amplified here in the United States where the population is10 times that of Canada and where we can BBQ year-round in many parts of the country. So, if you’ve got a metal-bristled BBQ brush, please get rid of it and opt for an alternative, such as a wood brush or scrub pad. Do some research; you can find some much safer alternatives that eliminate the risk of swallowing bristles and that are also chemical-free. vanKampen, S., “Canadian surgeons urge people to throw out bristle BBQ brushes,” CBC News, August 31, 2016; http://www.cbc.ca/news/health/barbecue-brushes-dangers-swallow-throat-wire-bristle-dempsey-1.3741578, last accessed September 9, 2016.